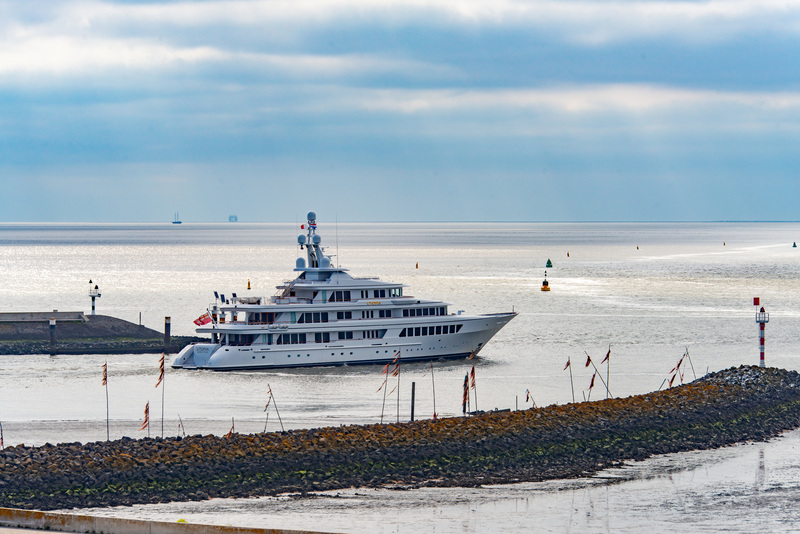 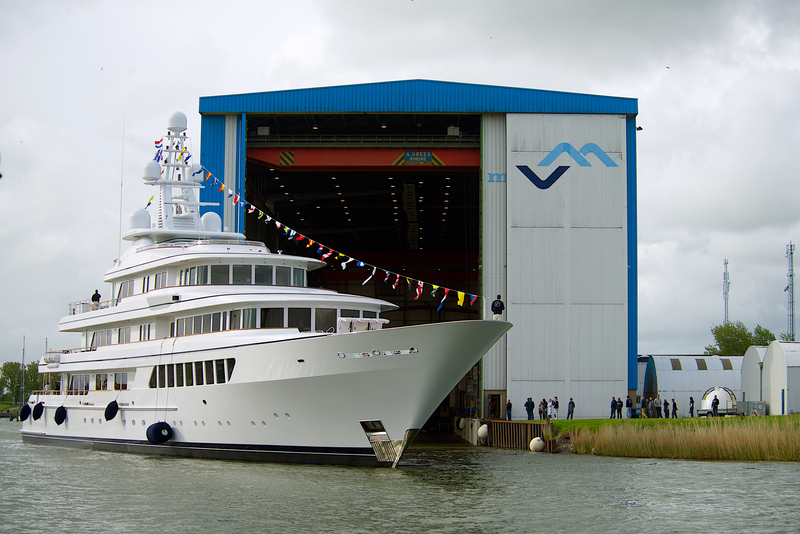 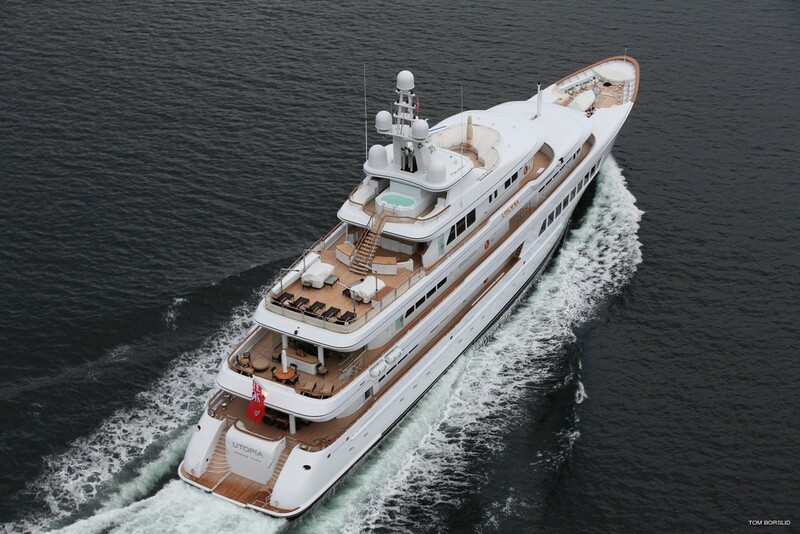 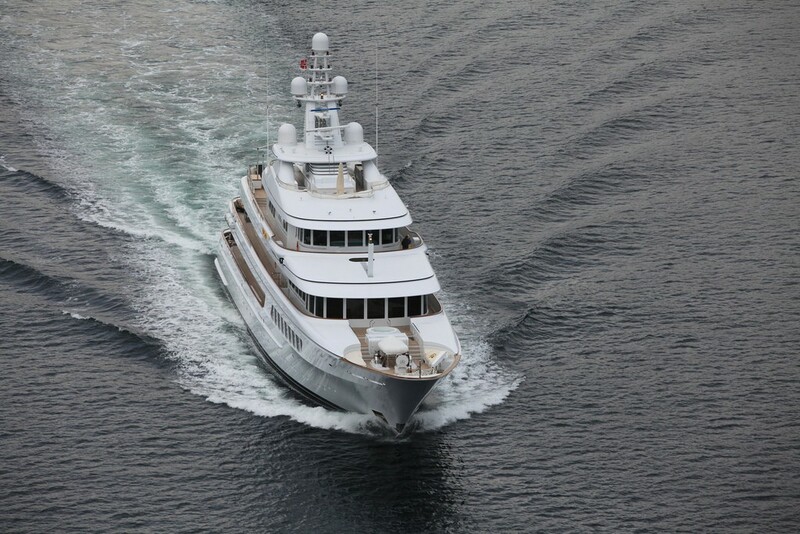 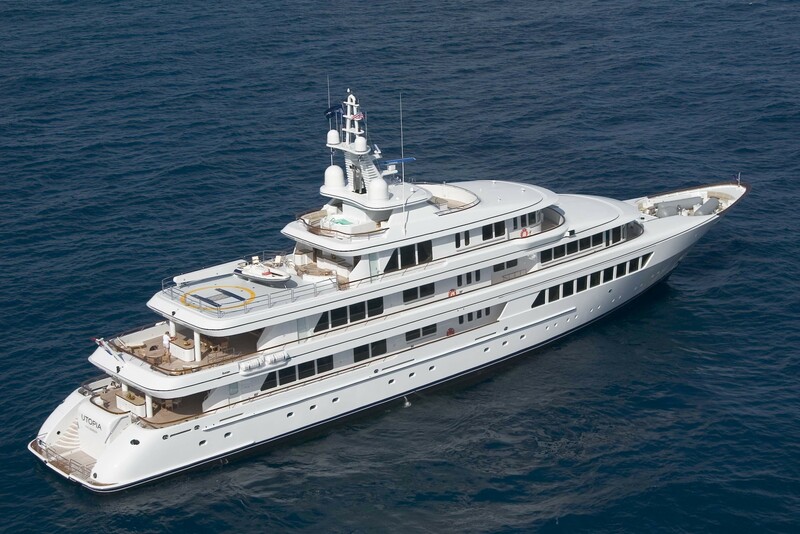 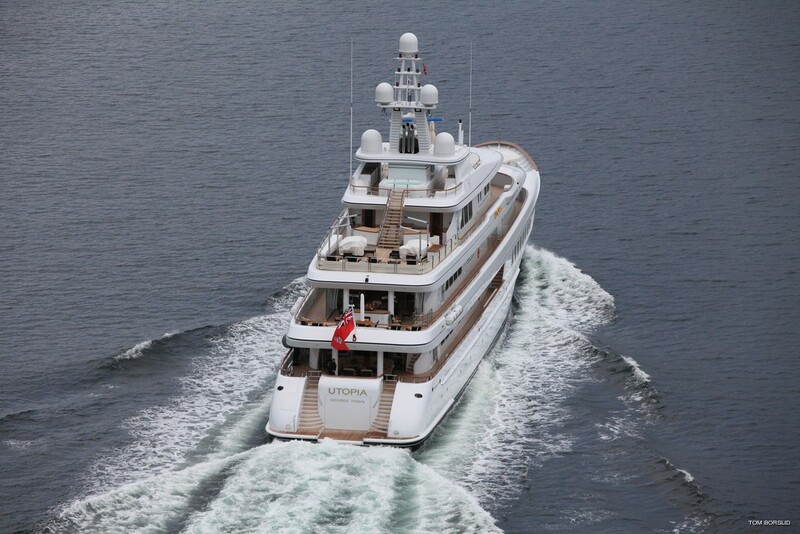 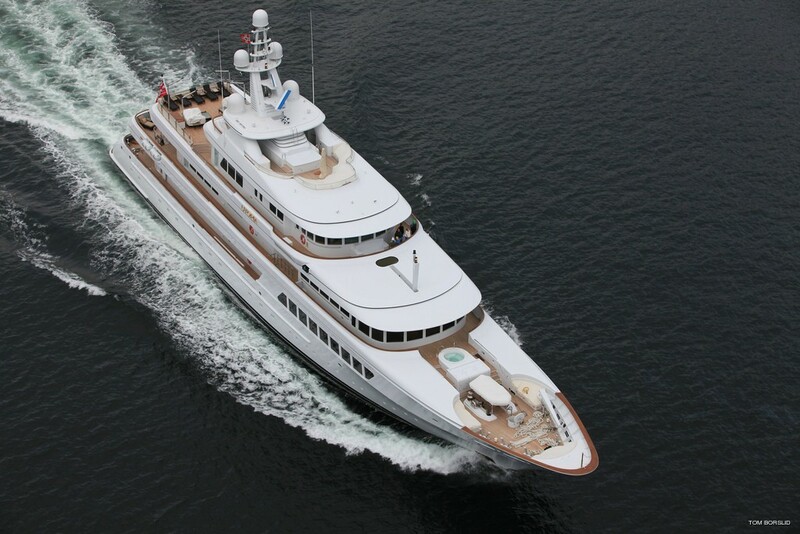 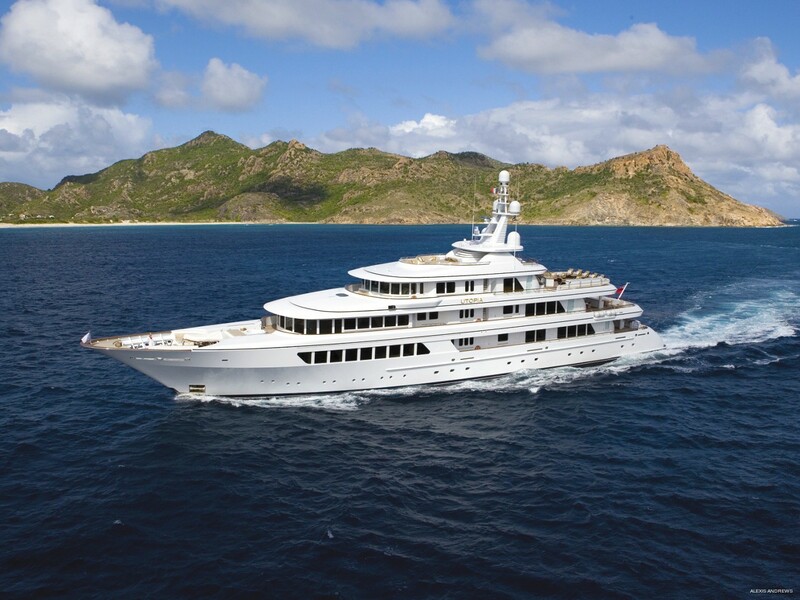 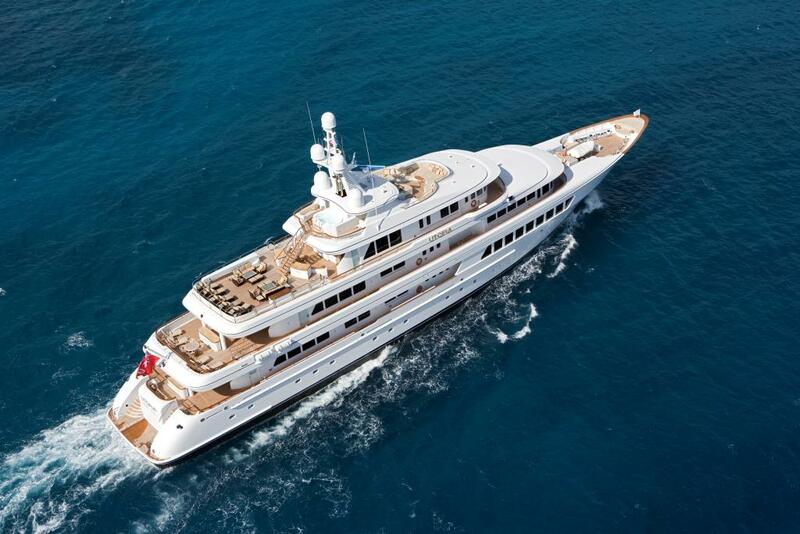 UTOPIA measures 71m (234'1'') and was built by the renowned Feadship shipyard. 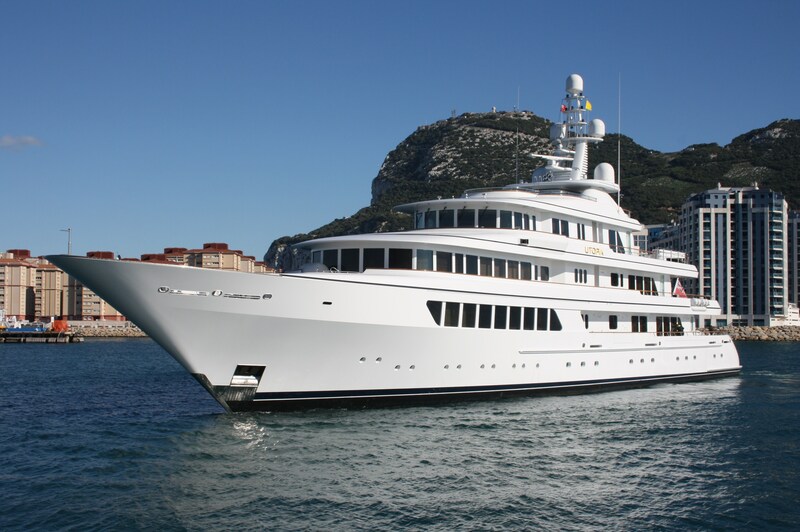 She was launched in 2004 and underwent a refit in 2008, 2013 and 2018. 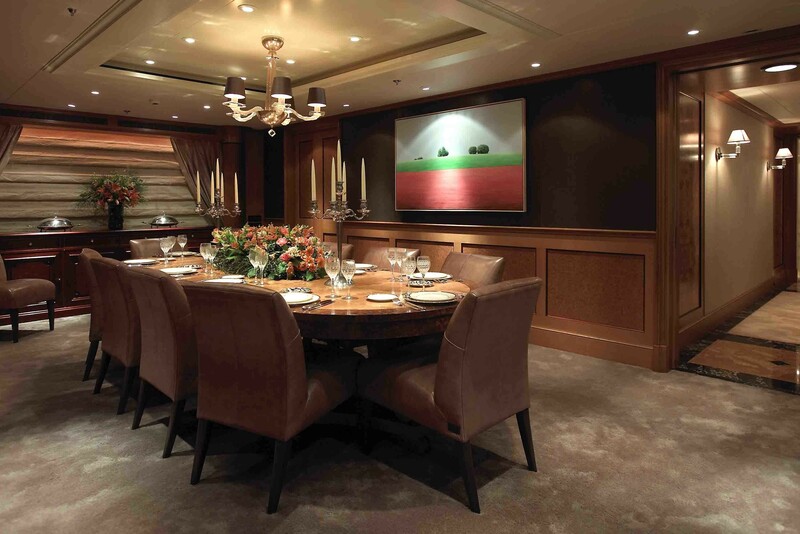 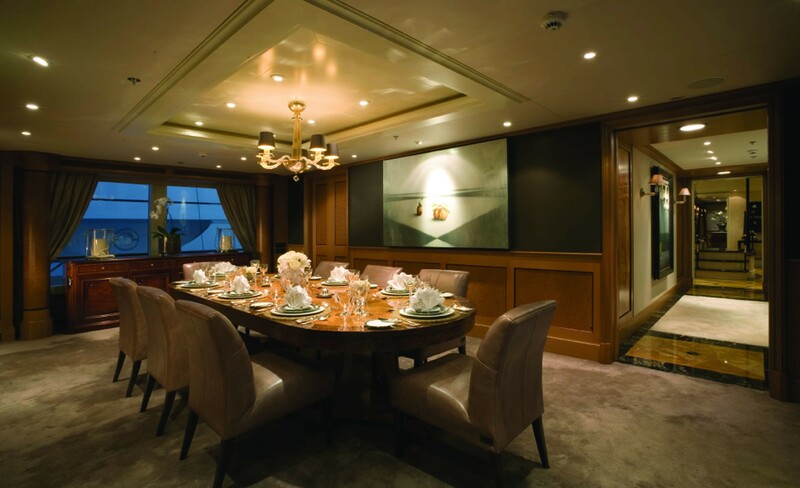 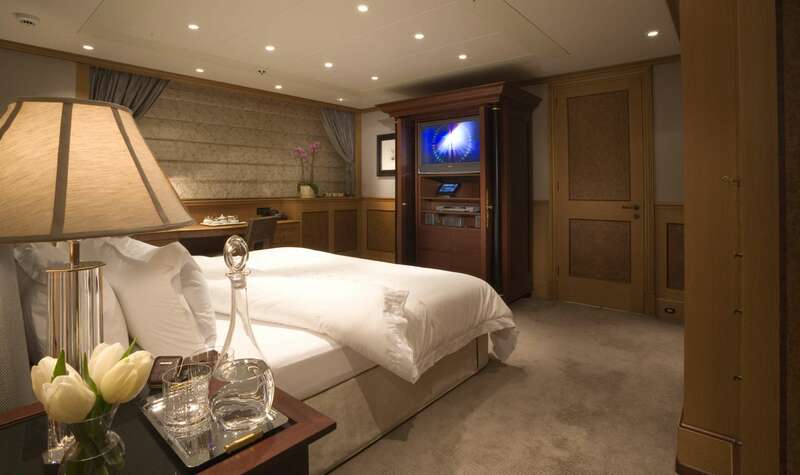 This luxury motor yacht provides sumptuous accommodation for up to 12 guests in 6 cabins. 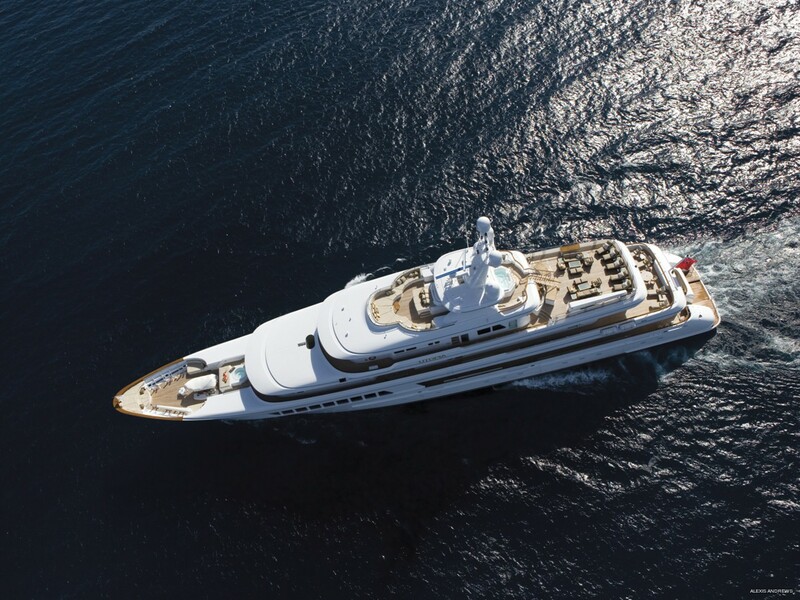 The yacht offers a large Spa Pool pool, zero speed stabilizers and News Direct service - a large selection of newspapers which can be printed on demand. 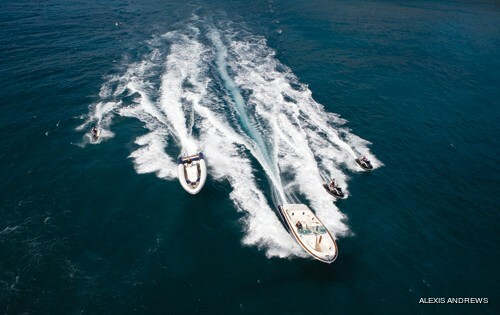 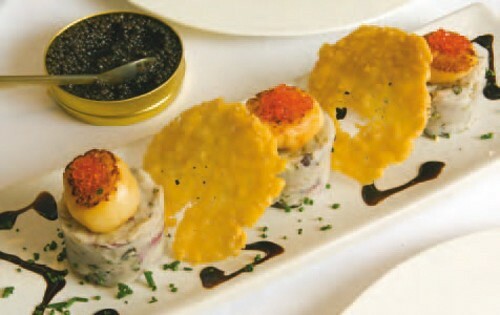 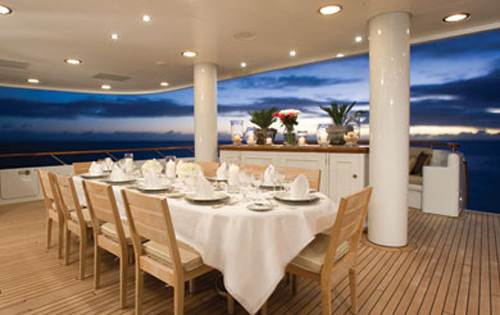 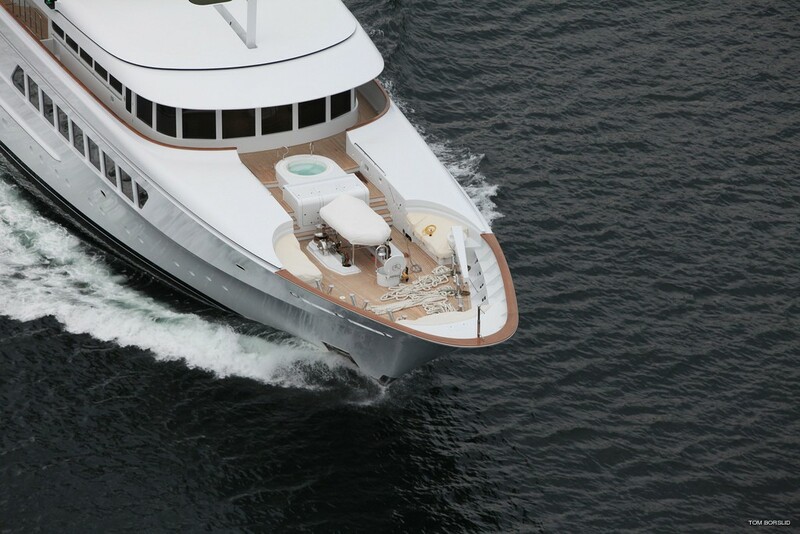 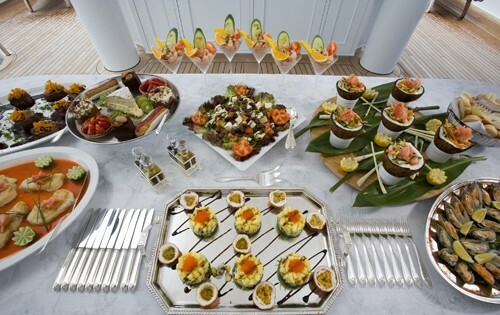 In total, she provides you and your charter party with a total of magnificent six decks to utilise at your discretion. 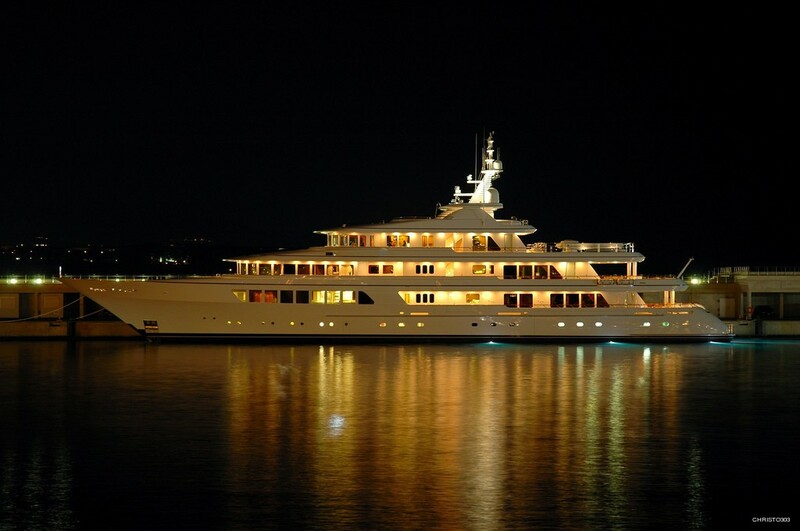 One of which is normally entirely devoted to the owners and/or the yacht charter principal. 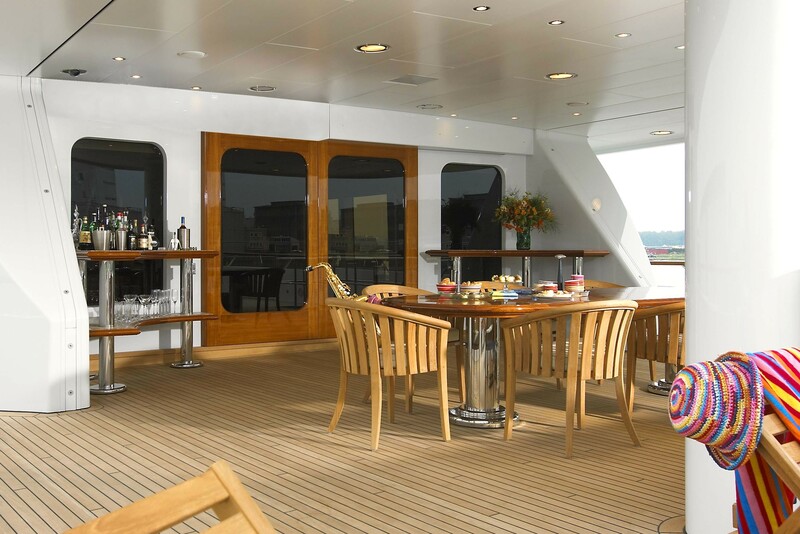 This owners’ deck spans 50 square meters of space and offers a private Jacuzzi and dining terrace, your own sky lounge, a gym and of course a stateroom (with a stunning 270° semi-circular window). 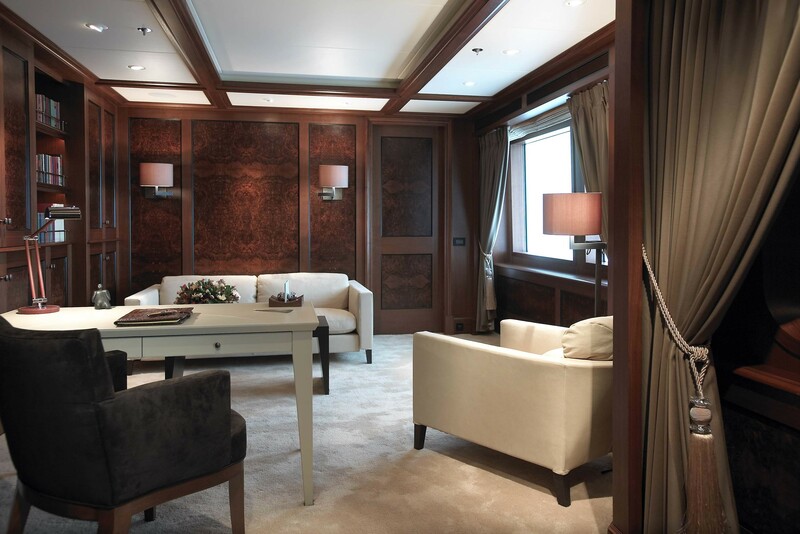 The beautifully appointed and spacious accommodation continues into the remaining five guest suites. 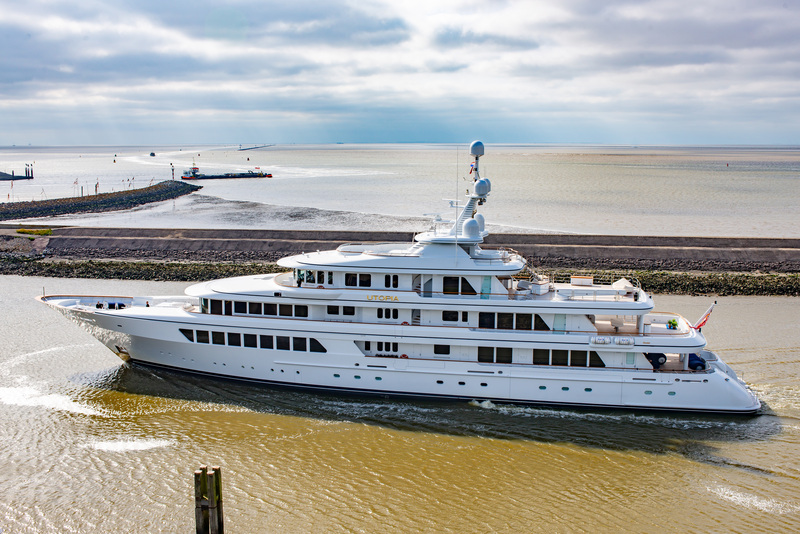 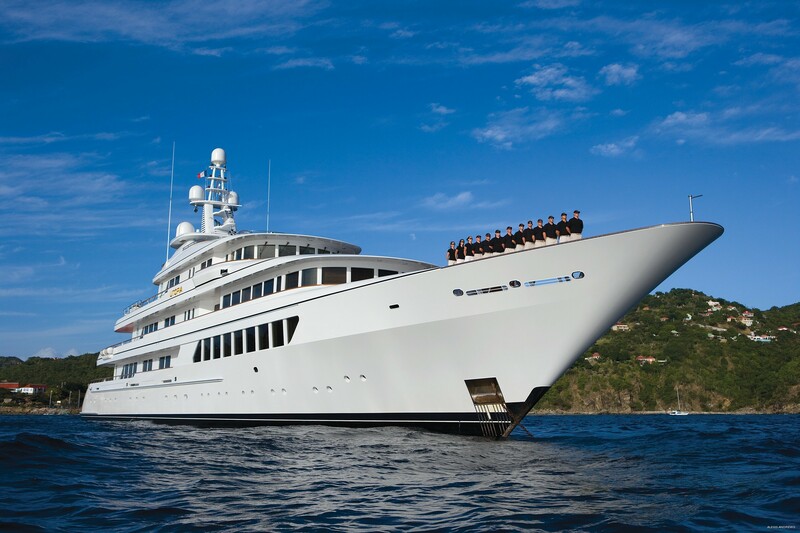 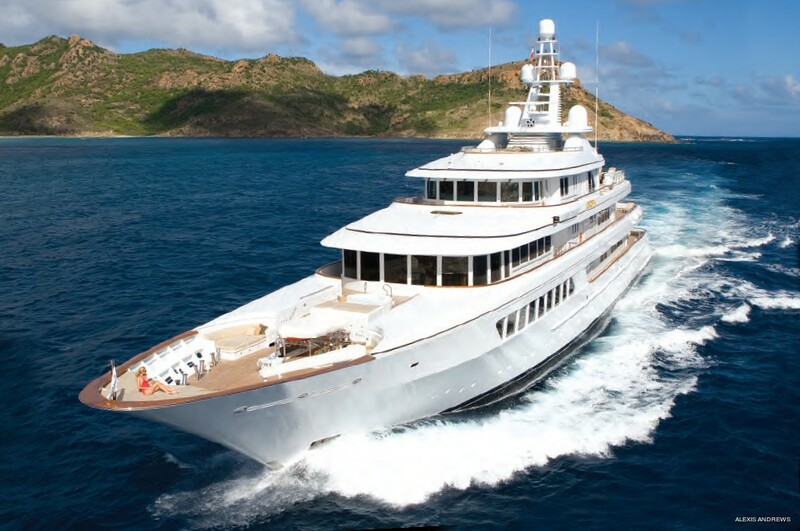 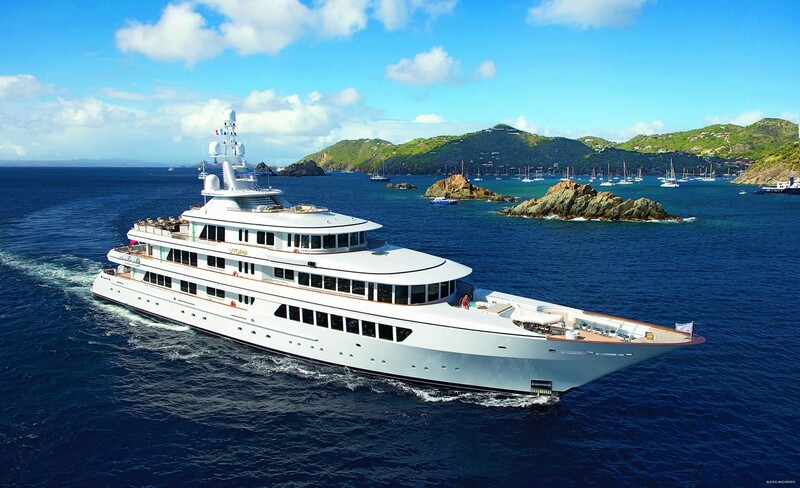 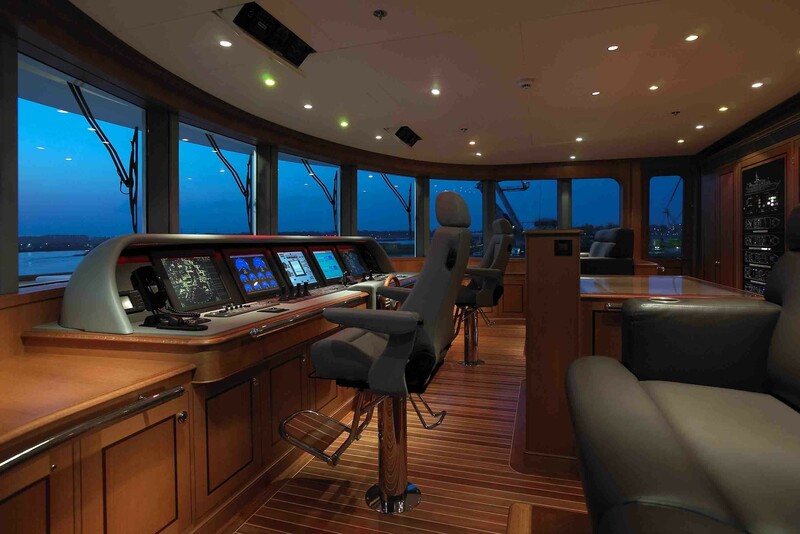 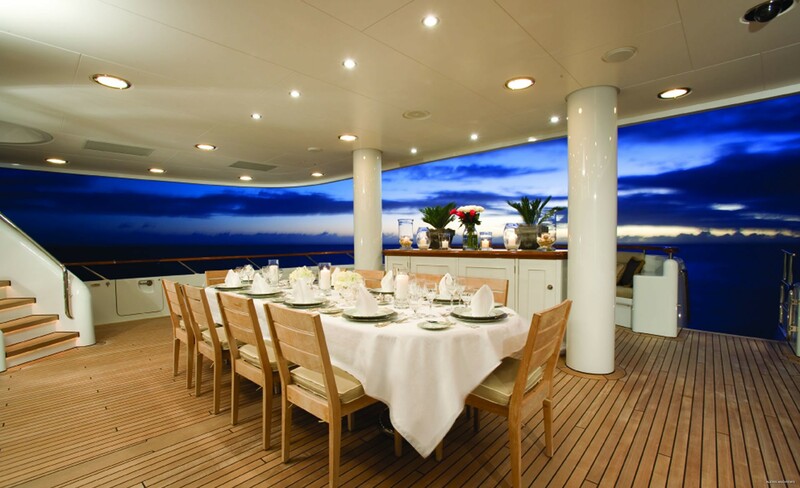 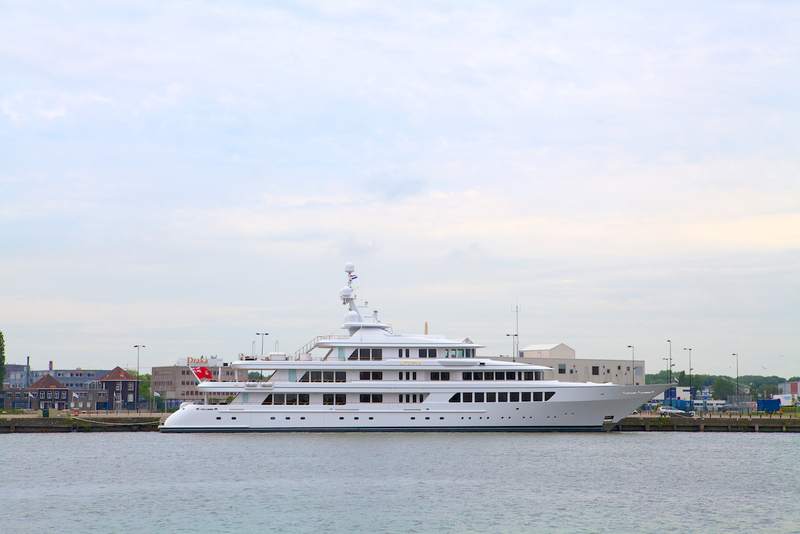 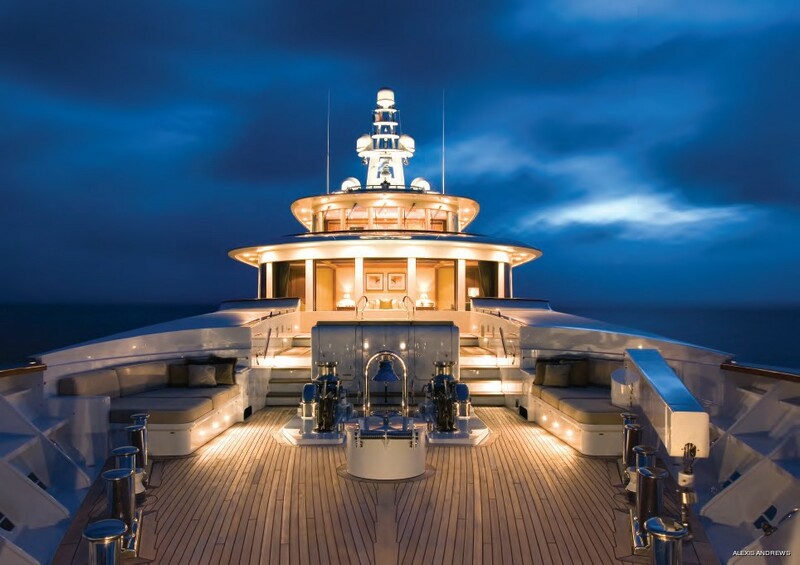 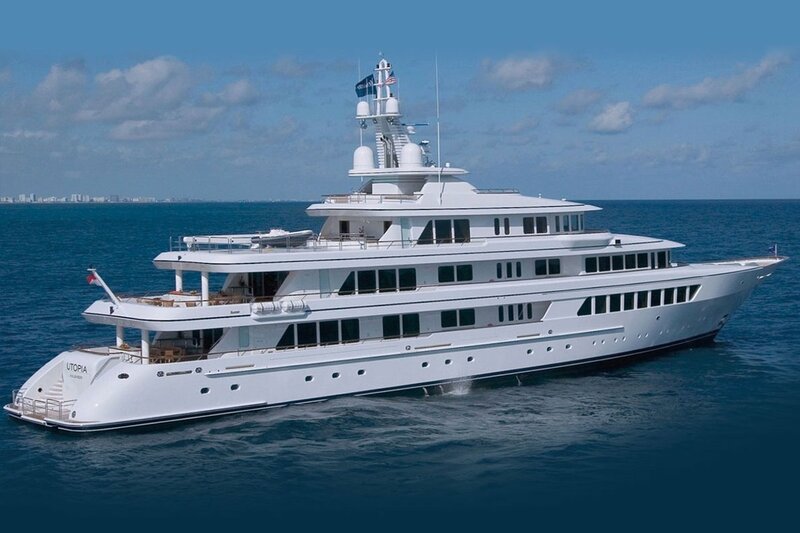 The Feadship UTOPIA offers 4 guest decks an owners' deck and ample exterior and interior living spaces. 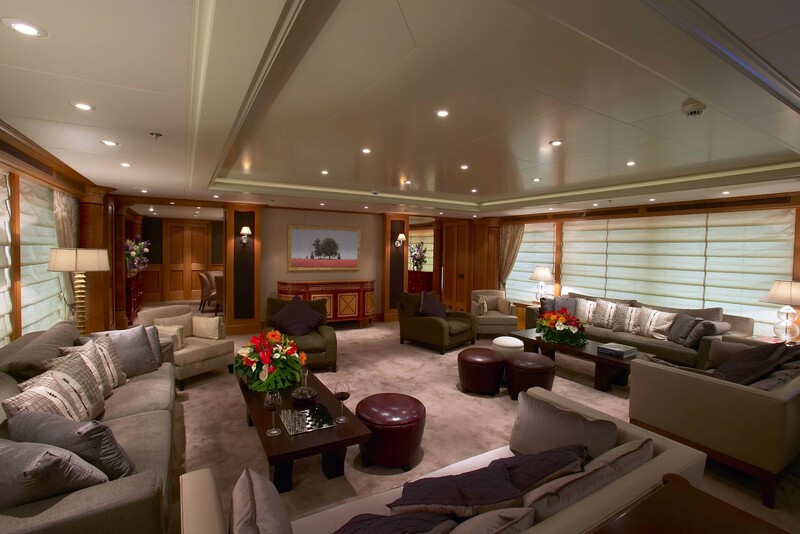 The interior is the work of Redman Whiteley Dixon and boasts a spacious layout with a classically elegant and sophisticated ambience. 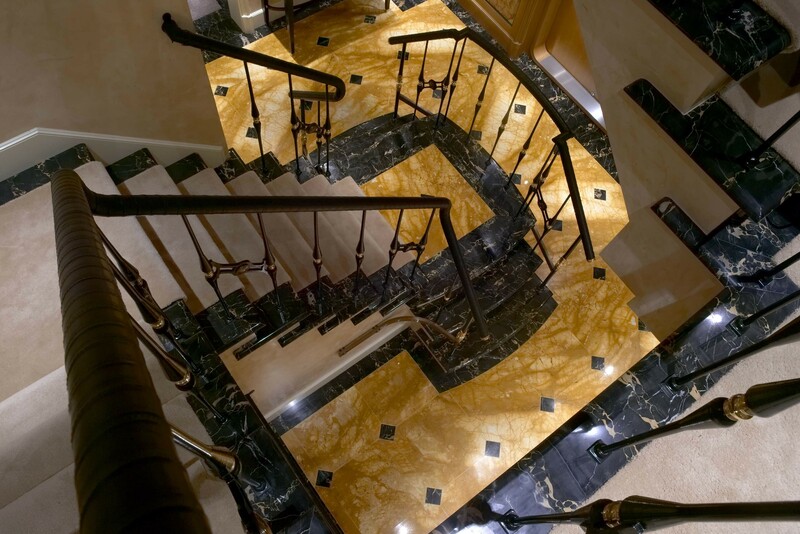 The yacht was finished with some of the finest marbles, oak panels and burl inlays, including the addition in 2008, of a stunning marble central stair case, leading to all guest decks. 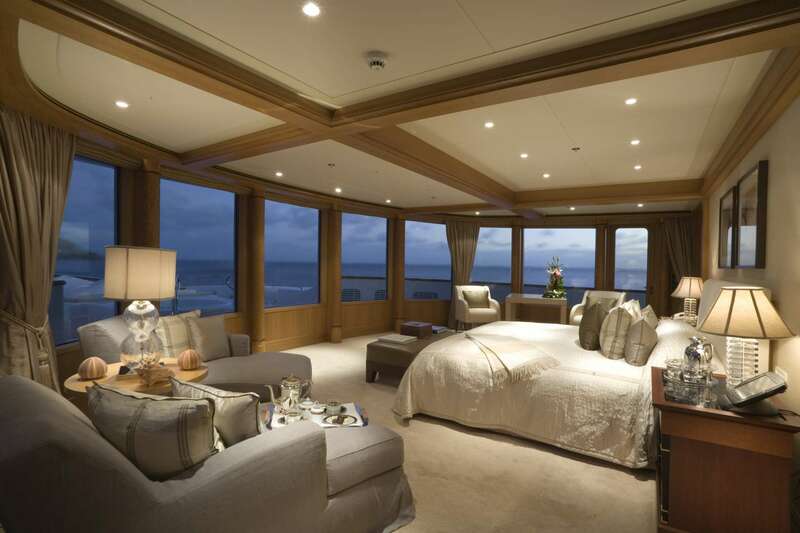 Motor yacht UTOPIA offers 2 VIP cabins with king size beds forward on the main deck, benefitting from idyllic sea views. 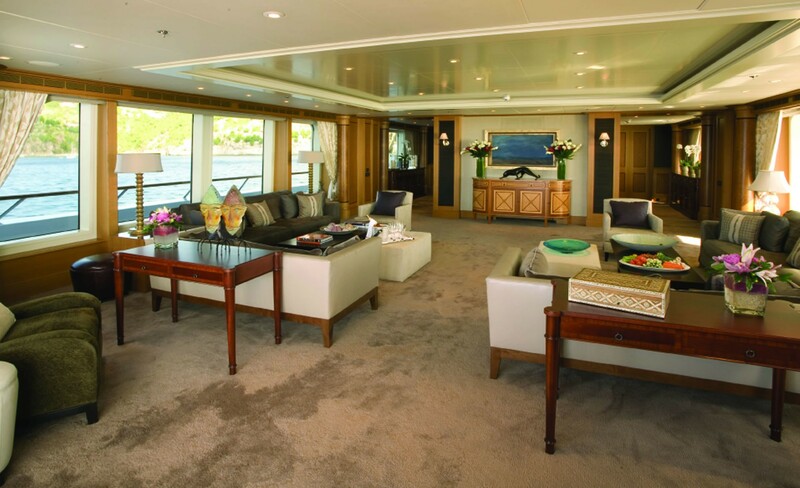 Above the main deck, the middle deck is dedicated to the owners' suite offering a large forward facing cabin, with king size bed and 180° vistas, gym, lounge and private aft deck with chaise lounges and alfresco dining area, ideal for a family setting. 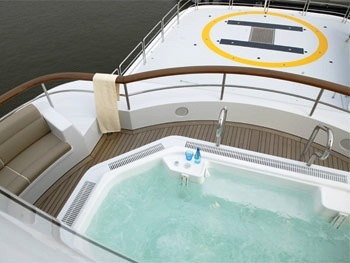 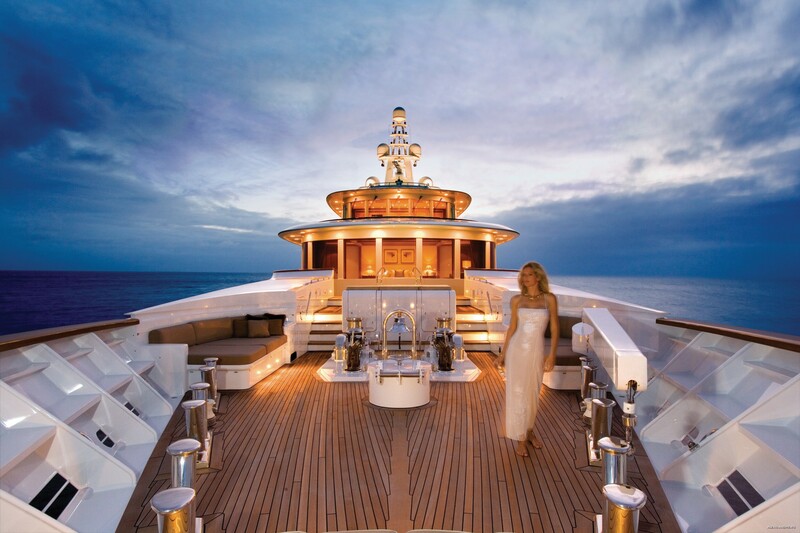 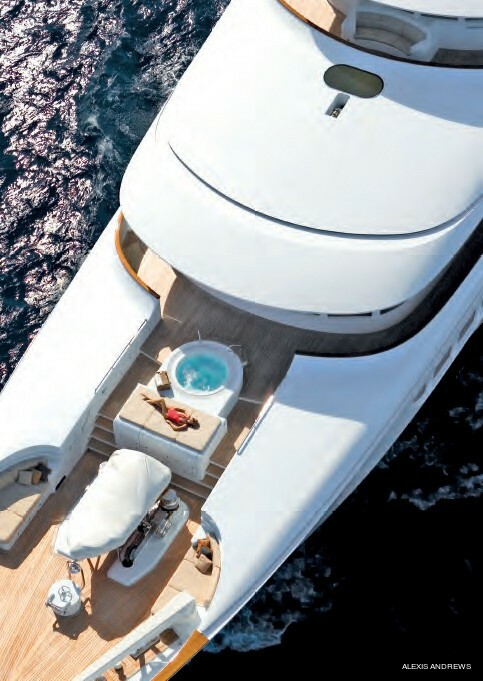 The deck wraps around the yacht, where forward is a deluxe private Spa Pool tub and sun pads. 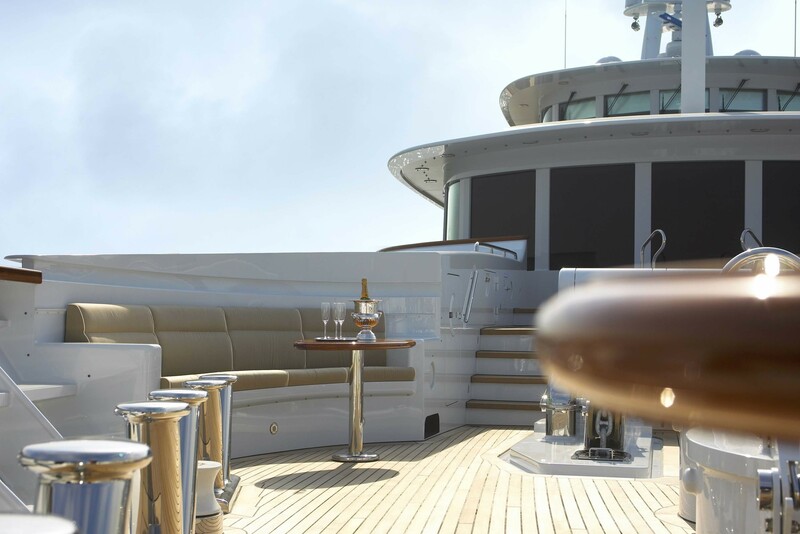 UTOPIA boasts a skylounge with further plush bespoke furnishings, wet bar and fireplace; the ideal place to enjoy and evening aperitif and unwind. 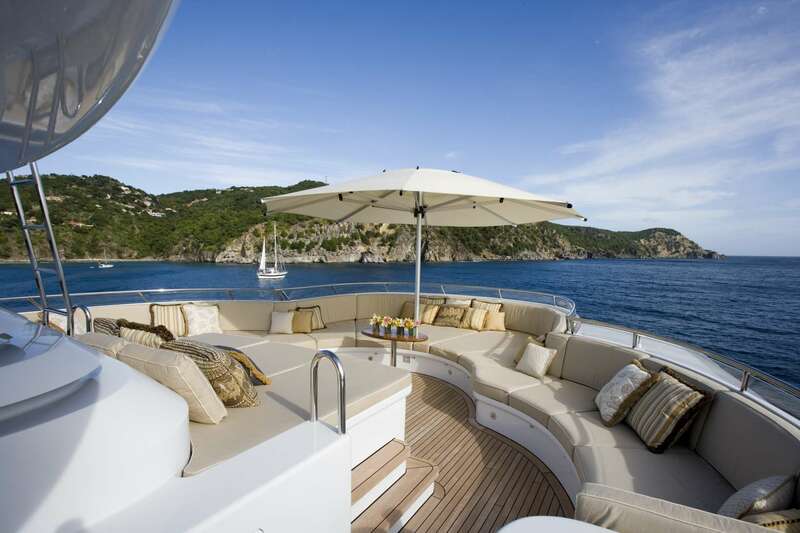 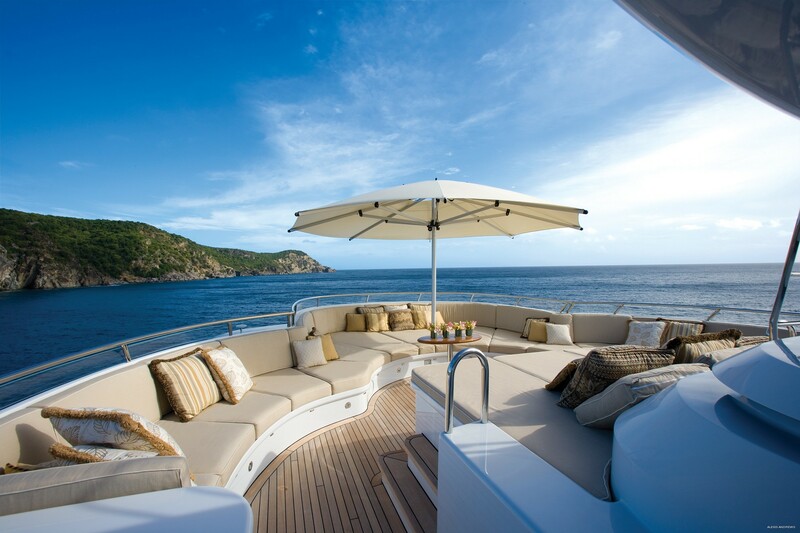 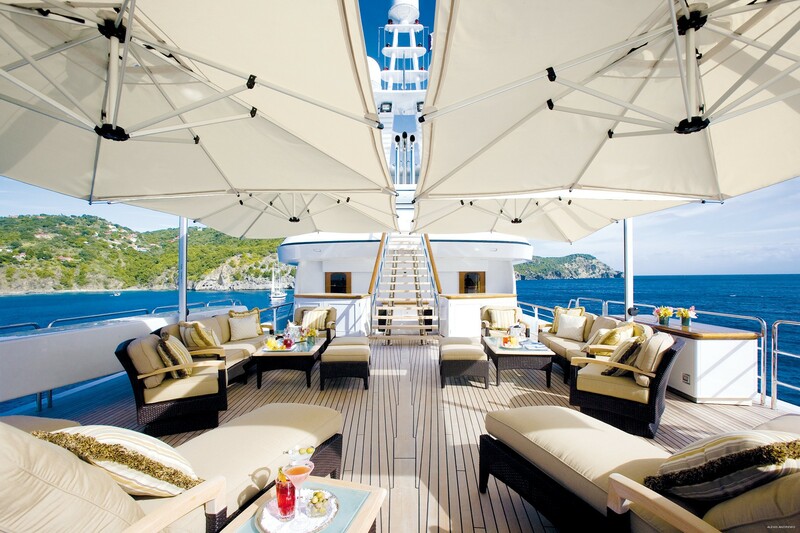 Aft of the skylounge a large sundeck offers plenty of chaise lounges, sunpads and an optional Bimini cover. 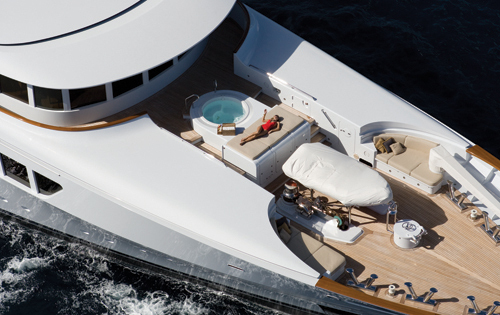 A central exterior stair case leads to the sundeck with a large Spa Pool tub and ample sunpads. 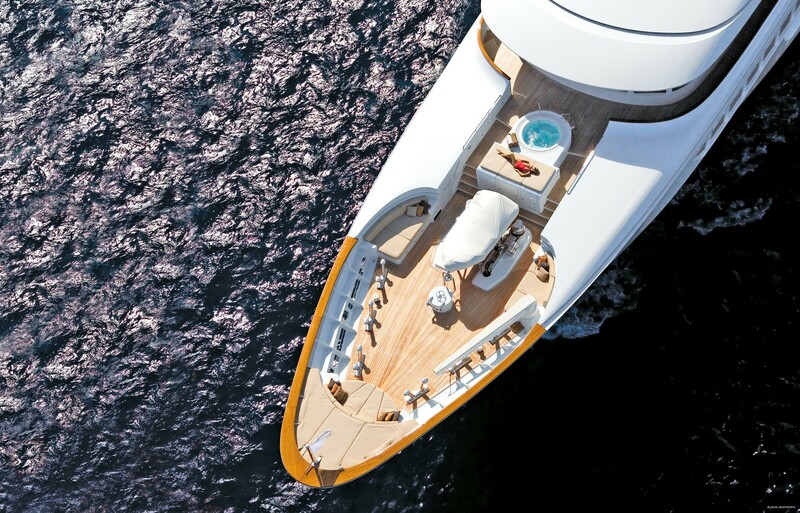 With a staggering 11.4m (37.4ft) beam, this multi deck vessel is sure to turn heads and be the envy of many as you gracefully cruise by. 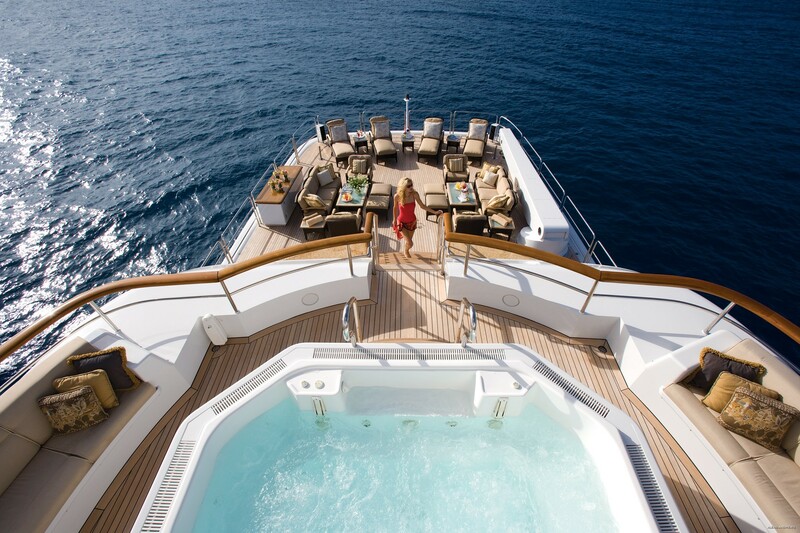 At anchor, the yacht enjoys an abundance of water toys to keep everyone entertained. 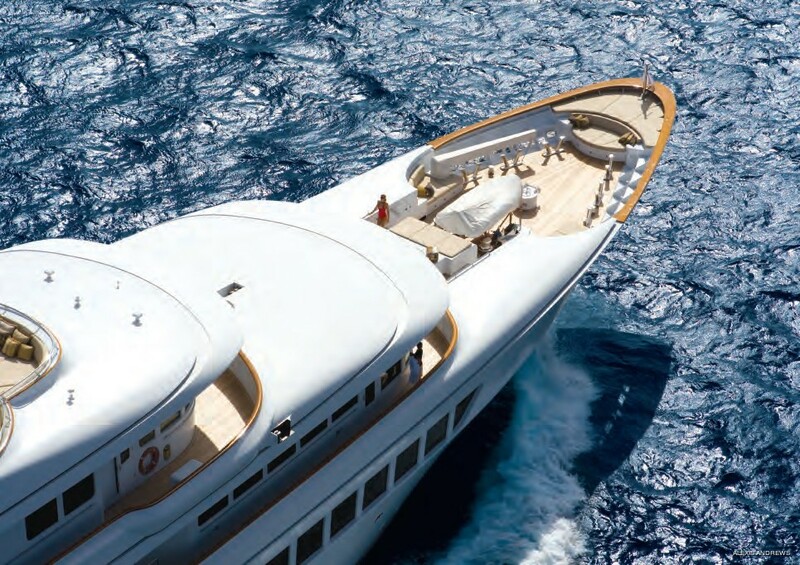 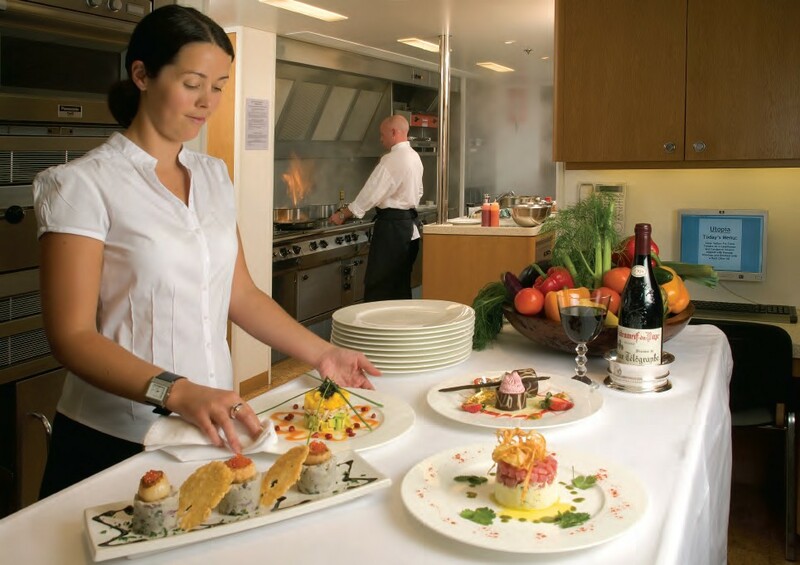 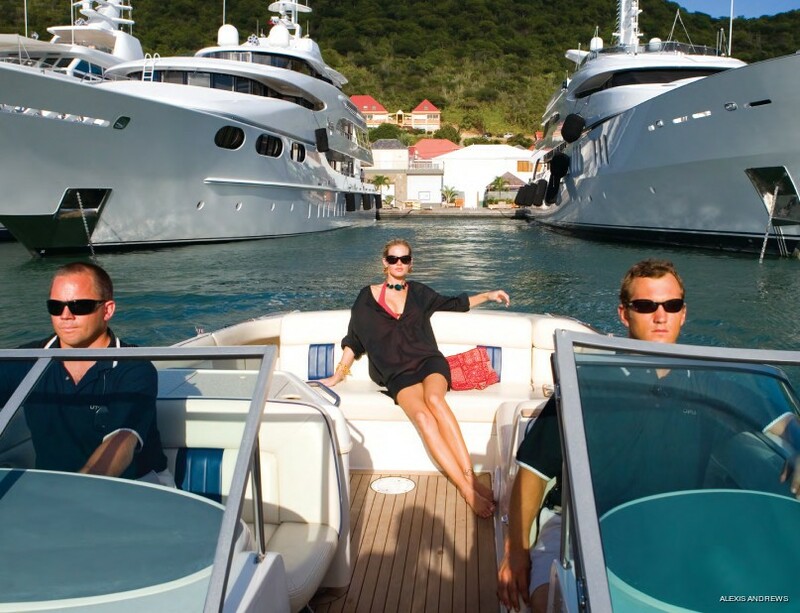 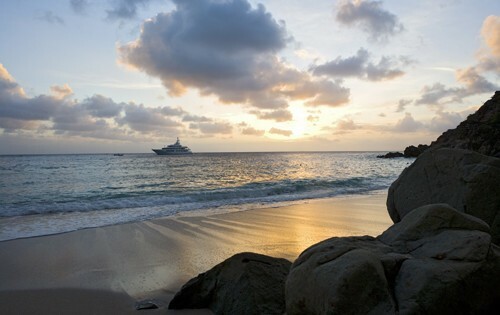 A crew of 17 is on hand to ensure a memorable and relaxing luxury charter experience. 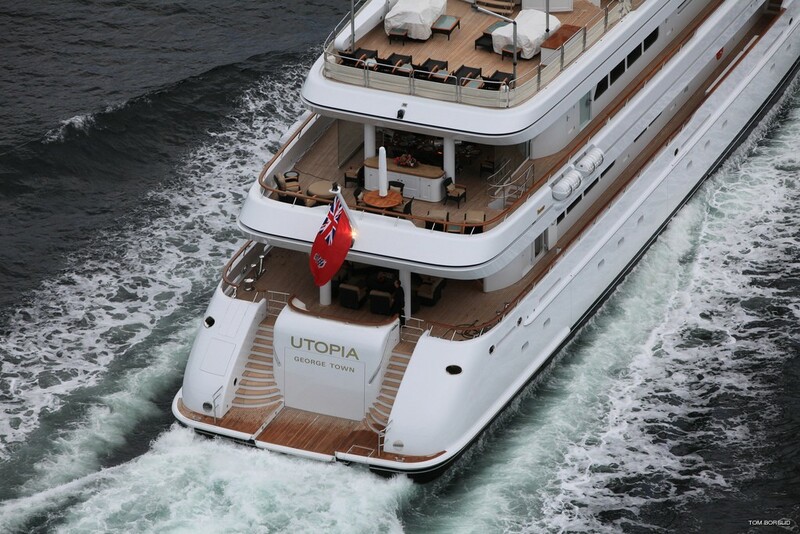 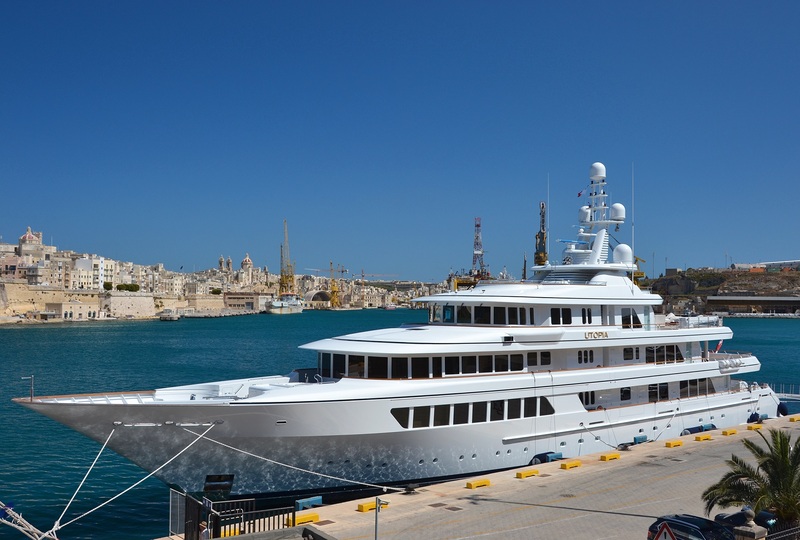 In 2013 Utopia yacht received an extensive repainting work as well as a number of mechanical improvements and updates including a new HMSA Sewage treatment plant system and new A-Sea water cooled shore converters. 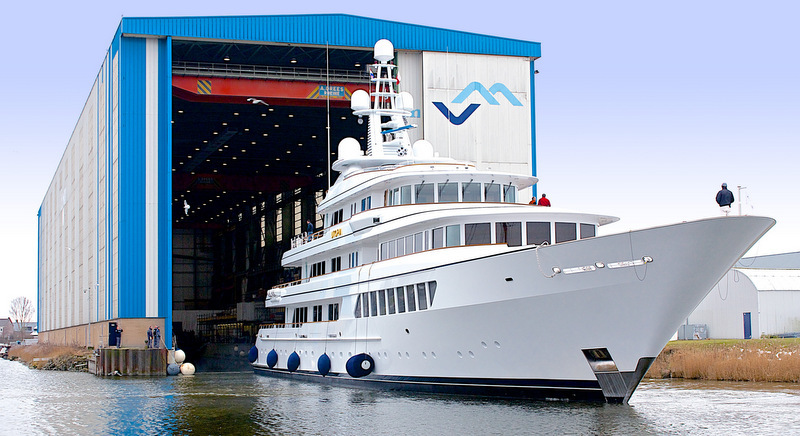 A new paint job of the superstructure, works related to a 15-year survey from Lloyd’s, numerous technical updates in the engine room as well as some work on her interiors. 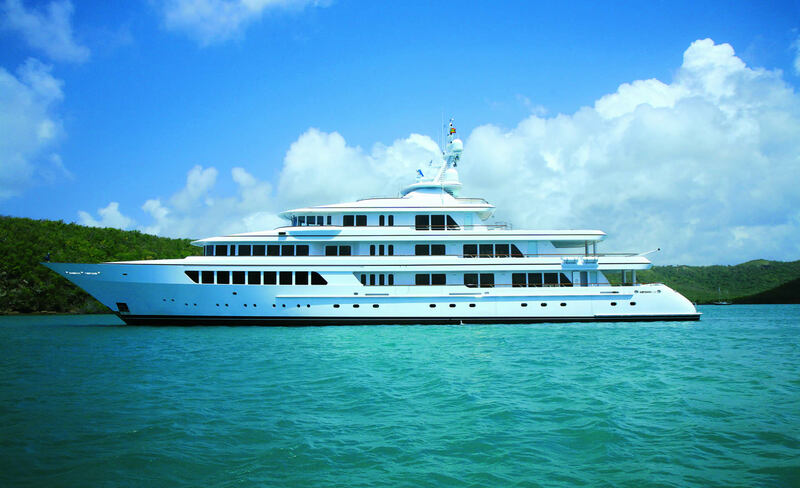 UTOPIA provides superb accommodation for up to 12 charter guests in the following layout: The middle deck boasts the Owner’s stateroom forward with an excellent view - Spa Pool and private owner’s deck forward with seating around. 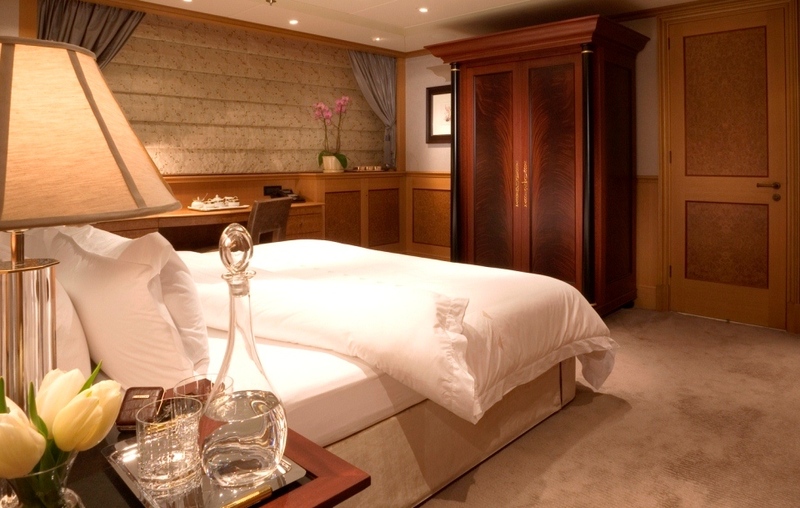 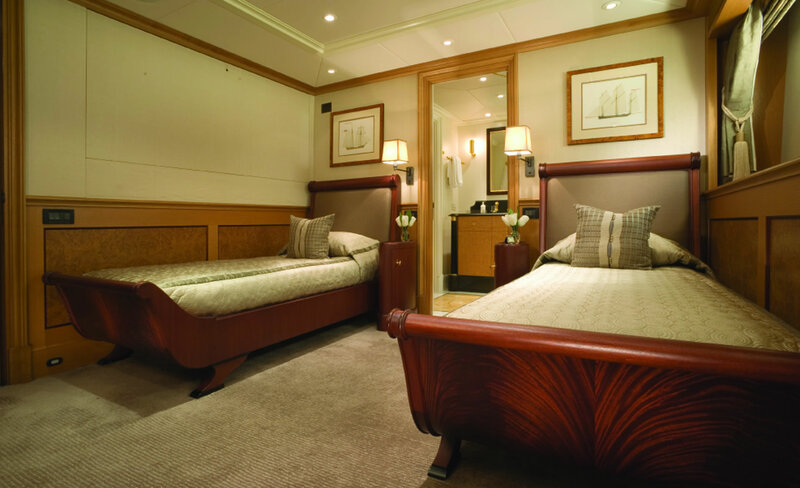 Further down on the lower deck there are two twin-bedded guest staterooms with Pullmans and en suites head/bath. 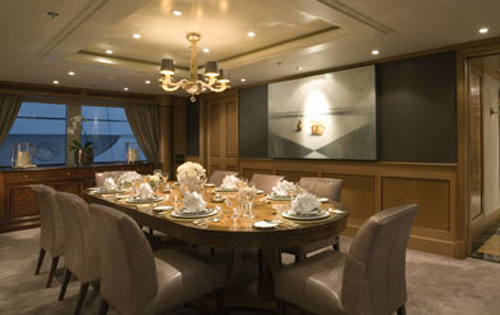 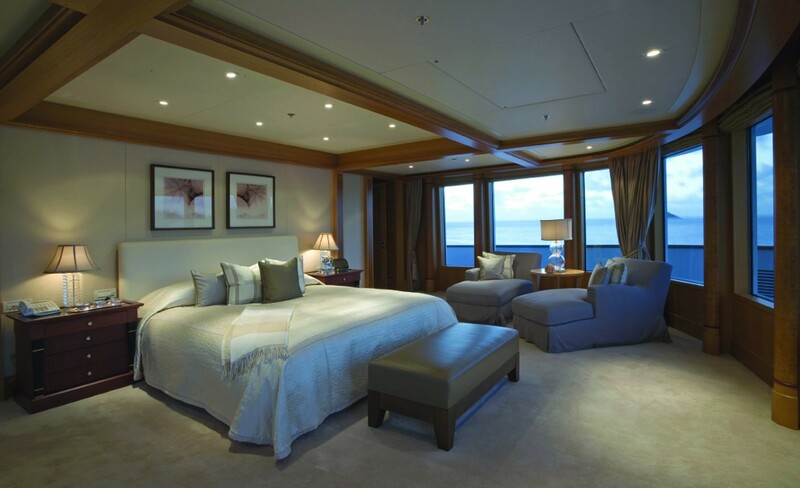 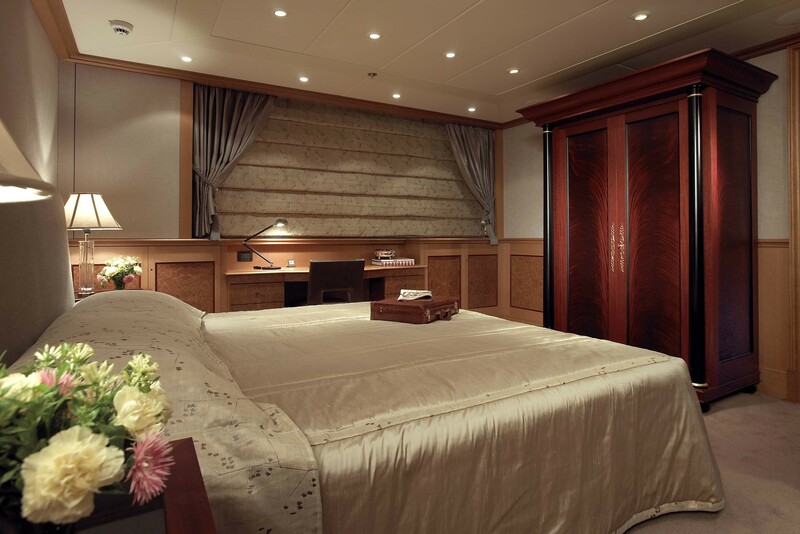 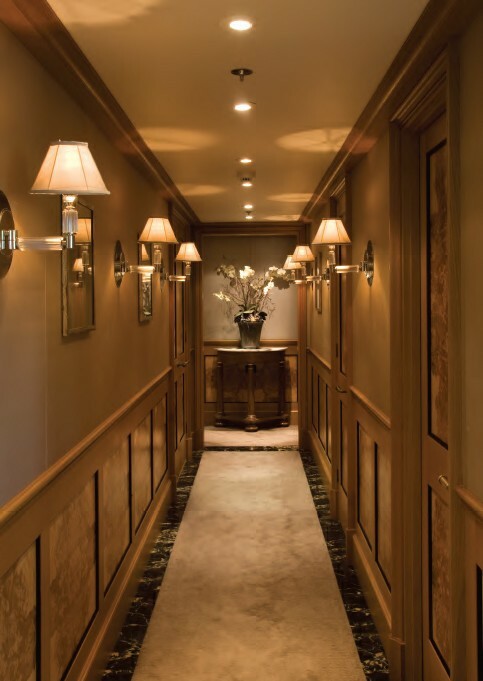 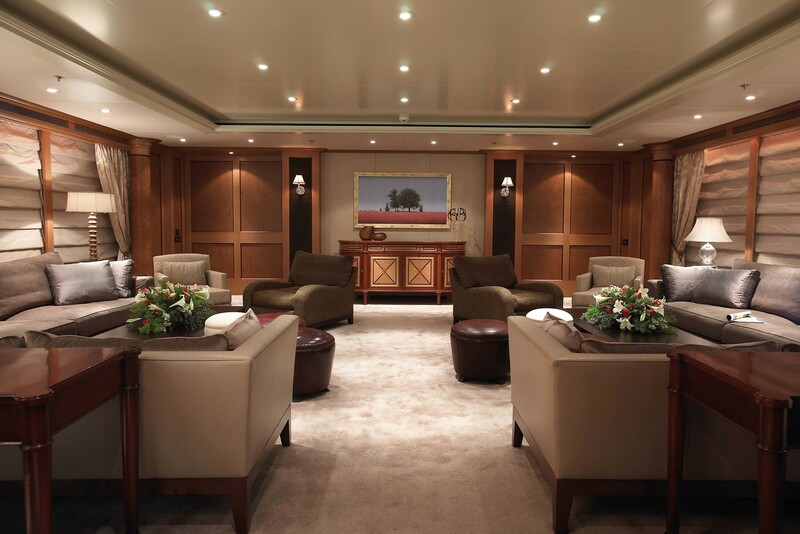 The main deck features two equal king-sized VIP staterooms, full width, each with en suite with tub and shower. 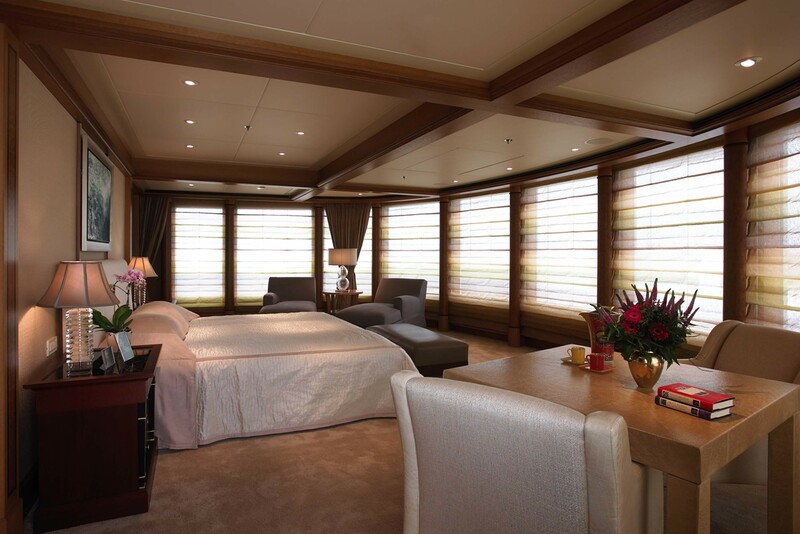 There is also a twin-bedded guest cabin, full width, to starboard offering en suite bathroom with a tub and shower. 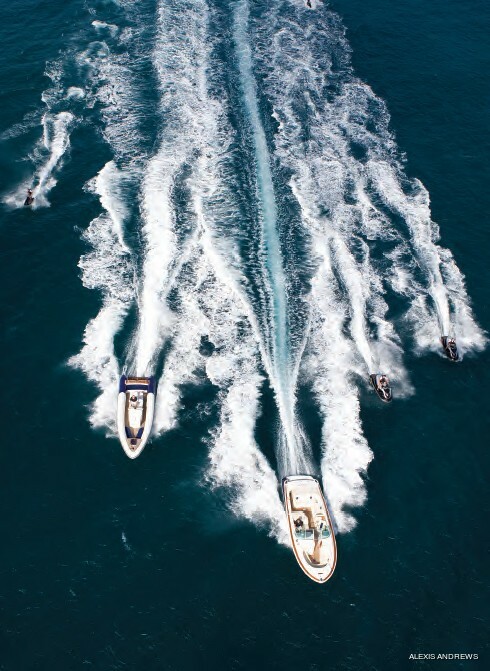 The Luxury Motor Yacht offers a comprehensive list of yacht charter amenities and water toys, including two 8.5m (28’) tenders in port and starboard tender garages ( 1 RIBTEC and Chris Craft), one 5.5m (18’) MCA RIB tender usually on the Heli deck, one Dive compressor, six sets of SCUBA gear, two 2 man Wave runners, two Stand up jet skis, two Sea Kayaks, two Windsurfers, Water skies, wakeboard, tubes, banana, two Laser Pico sail boats, one SNUBA 4 man surface dive apparatus. 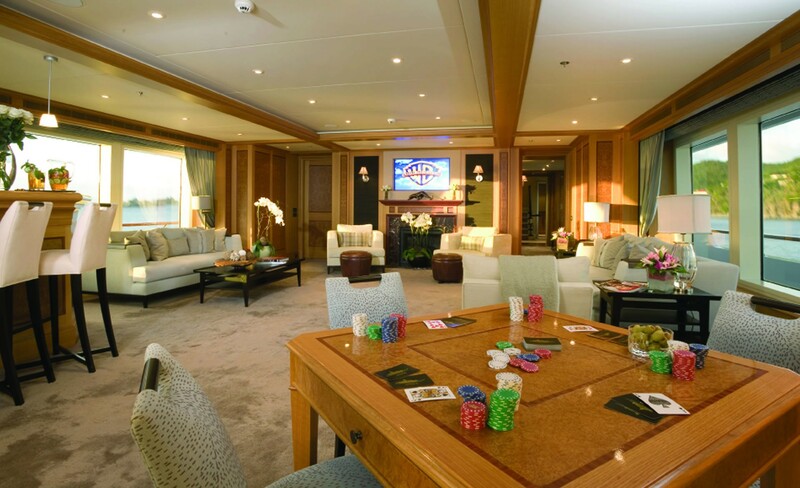 Audio Visual Equipment and Deck Facilities include a BBQ grill on the centerline, a Large Spa Pool tub, Video on demand for the lounges and Master suite, a Communication equipment to GMDSS for worldwide operation, NERA Saturn class B Satcom, Nera Satcom Mini M Sea Tel worldwide Sat TV, Panasonic Hybrid phone exchange, VSAT internet connections with wired LAN in all Guest cabins - WIFI in also accessible in most areas. 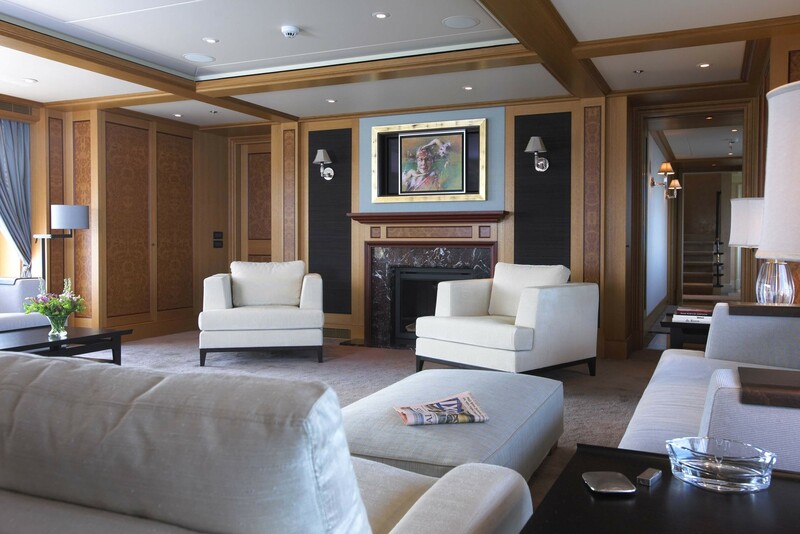 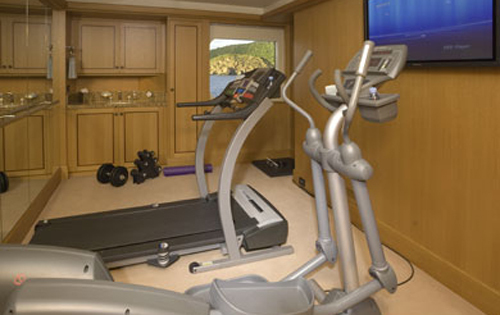 Furthermore, there is Kaleidescape in all common areas and cabins, Sky TV in the Mediterranean & DLA in the Caribbean, Play station 3, Wii, 800 movie library, Music library on iPods, Board games, 42" TV in the lounge and 37" TVs in the guest cabins.